Royal Bank of Scotland plc £1 note issued on 3 December 1994 to mark the 100th anniversary of the death of Robert Louis Stevenson. 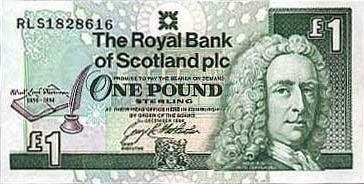 The Royal Bank of Scotland has issued several £1 notes commemorating Scottish individuals and events in recent years. The first was the European Summit in Edinburgh dated 8 December 1992. That was followed by this Robert Louis Stevenson commemorative note. On 3 March 1997 the bank issued its Alexander Graham Bell commemorative. The fourth commemorates the first meeting of the Scottish Parliament in hundreds of years on May 12 of 1999.